Adam and Eve's first two sons differed vastly in their personalities and behavior. 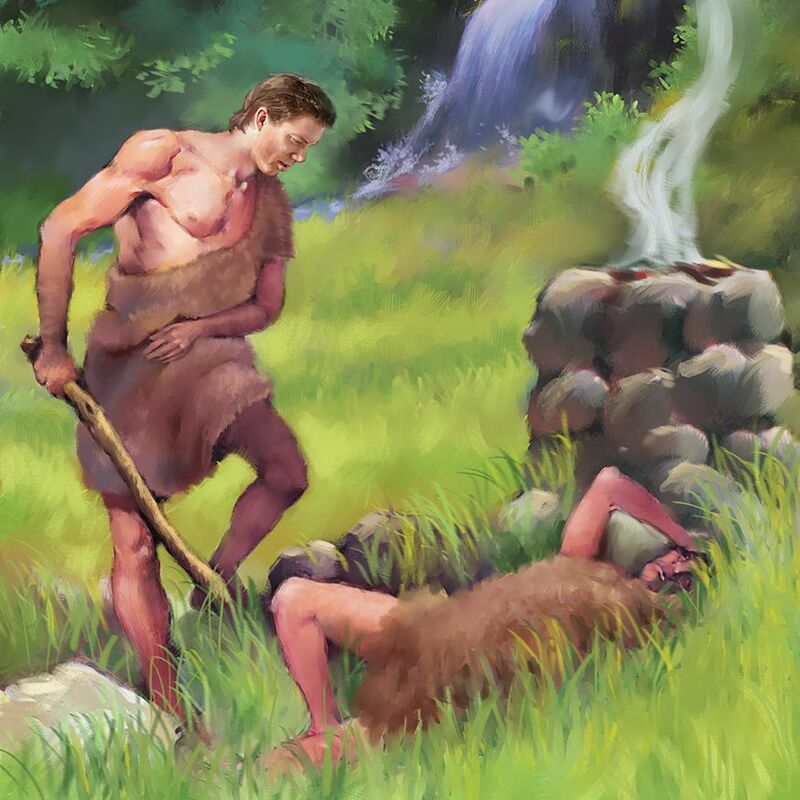 Cain longed to farm and build, while Abel loved to roam the hills and meadows with his flocks. After sin entered this new world because of Adam and Eve's disobedience, God established a sacrificial system and explained that without the shedding of blood there is no forgiveness for sin (Hebrews 9:22). He told them that these sacrifices pointed forward to the time when Jesus would become a man and die as the Lamb of God for the sins of the world. Abel faithfully brought a young lamb as a sacrifice for his sins, but Cain thought it was unnecessary to obey God's command so precisely. He considered the sacrificial system to be messy and reasoned that as long as he brought an offering and worshiped God, the details wouldn't matter. So he brought an offering of his own works, some produce from the field. Cain watched with jealous anger as fire came down from heaven and consumed Abel's sacrifice but left his own offering untouched. The Lord lovingly urged Cain to humble himself and obey, but Cain stubbornly persisted in his rebellion. Abel also tried to gently reason with his older brother, but Cain flew into a rage. By the time he regained his senses, Abel's bloody body lay still at his feet. God pronounced a curse upon Cain, and when Cain complained about his sentence, the Lord placed a mark upon him lest future generations take revenge for this first homicide. The book of Revelation tells us that, in the last days, there will again be a battle between Christians regarding how and when to worship. Soon everyone will be identified either by the seal of God or the mark of the beast. Revelation 7:3. Saying, Hurt not the earth, neither the sea, nor the trees, till we have _________ the servants of our God in their foreheads. Those who receive God's seal in their foreheads will be protected during the plagues (Psalms 91:7-11). 2. What is this "seal" the righteous have in their foreheads? Isaiah 8:16. Bind up the testimony; seal the ____ among my disciples. God's seal is found in His law. A seal is what makes a document official, and it normally contains three characteristics: Name, Office, and Territory. An example would be "Cyrus king of Persia" in Ezra 1:1. 3. Which of the Ten Commandments contains all the elements of a seal? The fourth commandment is the only one that contains all three elements of a seal: (1) "The Lord"--His name, (2) "made"--His office as Creator, (3) "heaven and earth, the sea, and all that in them is"--His territory. 4. What has God given as a special sign of His power? Ezekiel 20:12. I gave them my ________, to be a sign between me and them, that they might know that I am the Lord that sanctify them. Ezekiel 20:20 Hallow my sabbaths; and they shall be a sign between me and you, that ye may know that I am the Lord your God. God clearly states that He gave the Sabbath as a sign of His power to create and sanctify. It is His seal, or mark of authority. The words "seal," "sign," "mark," and "token" are used interchangeably throughout the Bible (compare Genesis 17:11 with Romans 4:11 and Revelation 7:3 with Ezekiel 9:4). 5. What does the second beast of Revelation 13 force all to receive? 6. What is the mark of the beast? Choosing to obey the laws of the papacy (Sunday) rather than the laws of God (Sabbath) will leave you with the mark of beast. Romans 6:16 Know ye not, that to whom ye yield yourselves servants to obey, his servants ye are to whom ye obey, whether of sin unto death, or of obedience unto righteousness? "Q. Have you any other way of proving that the Church has power to institute festivals of precept? 1Peter Geiermann, The Convert's Catechism of Catholic Doctrine (St. Louis: B. Herder Book Co., 1957 edition), p 50. 2Stephen Keenan, A Doctrinal Catechism (New York: P.J. Kenedy & Sons, third American edition, revised, n.d.), p. 174. 7. Is either the mark of the beast or the seal of God visible? Hebrews 10:16. Saith the Lord, I will put my laws into their hearts, and in their ______ will I write them. Exodus 13:9 And it shall be for a sign unto thee upon thine hand, and for a memorial between thine eyes, that the Lord's law may be in thy mouth. Isaiah 59:6, 7 Their works are works of iniquity, and the act of violence is in their hands. ... Their thoughts are thoughts of iniquity; wasting and destruction are in their paths. Neither the mark of the beast nor the seal of God is outwardly visible. The forehead represents the mind, and the hand is a symbol of work. "On the hand" and "between the eyes" are consistent symbols in Scripture for a person's thoughts and actions (Exodus 13:16; Deuteronomy 6:8; 11:18). A person will receive the mark of the beast in his forehead by choosing to believe that Sunday is a holy day in spite of Bible truth. A person will be marked in the right hand by working on God's Sabbath or by outwardly keeping Sunday laws for convenient reasons--such as a job, family, etc. Although the sign is invisible to men, God will know who has which mark (2 Timothy 2:19). In a sense, each person will mark himself. If I respect and regard God's holy Sabbath, He will mark me as His own. If I regard the beast's false Sabbath, He will mark me as belonging to the beast. 8. How does Jesus determine if we are His servants? Romans 6:16. Know ye not, that to whom ye yield yourselves servants to obey, his servants ye are to whom ye _____. 9. Does anyone have the mark of the beast now? Revelation 13:17. No man might ____ or sell, save he that had the mark, or the name of the beast, or the number of his name. No person has the mark now. When it becomes a forced issue, only those who have received the mark of the beast will be able to buy or sell. At that time, people who keep God's holy Sabbath will do so at the risk of their lives (Revelation 13:15), and those who choose to profane His holy day and officially cast their votes by placing the laws of men above the Law of God will be marked as belonging to Antichrist. All who are loyal to Jesus and His holy day will receive Jesus' glorious seal, thus making them His forever. Those who try to remain neutral will be counted for Antichrist (Matthew 12:30). 10. What two things does the Antichrist power attempt to change? Daniel 7:25. He shall ... think to change times and _____. Daniel 7 reveals an Old Testament description of the Antichrist power. It clearly predicts that the beast would attempt to change both God's laws and times. The papacy has tried to change God's laws by: (1) omitting the second commandment against veneration of images, (2) shortening the fourth commandment from 94 words to just eight in order to avoid mentioning which day is the Sabbath, and (3) dividing the tenth commandment into two commandments. The papacy attempted to change God's times by: (1) teaching people to recognize the first day of the week as the Sabbath instead of the seventh day, and (2) adopting the pagan Roman practice of beginning each day at midnight instead of sundown. God's timing for the Sabbath is from sundown Friday night to sundown Saturday night (Leviticus 23:32). No mortal should ever dare to tamper with God's sacred law or times (Matthew 5:18). 11. What was God's criticism of His ancient priests, or pastors? Malachi 2:8, 9. Ye have caused many to stumble at the law. ... Ye have not kept my ways, but have been _______ in the law. God is still hurt when His pastors are partial to eight or nine commandments and cause many to stumble over His command to keep the Sabbath holy. Virtually all churches admit in their official writings that there is no Scripture support for Sunday sacredness. Tragically, both Protestantism and Catholicism stand guilty before the judgment bar of God for throwing out the Bible Sabbath! God Himself gave the Sabbath as a sign, or mark, of His power to create and His power to sanctify and save (Exodus 31:17; Ezekiel 20:12). Dare any man tamper with this sacred sign, which represents the great God of heaven and all that He stands for? 12. How did God's ancient leaders regard the great things of His law? Hosea 8:12. I have written to him the great things of my law, but they were counted as a _______ thing. Times have not changed. God has placed the Sabbath, His great sign, in the middle of His law and begins that commandment with the word "remember." Yet many people today feel that keeping His seventh-day Sabbath is a strange thing. 13. What specific, solemn rebuke did God give to religious leaders regarding His holy Sabbath? Ezekiel 22:8. Thou hast ______ mine holy things, and hast profaned my sabbaths. Ezekiel 22:26 Her priests have violated my law, and have profaned mine holy things: they have put no difference between the holy and profane ... and have hid their eyes from my sabbaths, and I am profaned among them. God pointedly rebukes religious leaders who say that the Sabbath doesn't matter and who claim "Thus saith the Lord" when it is not true. 14. What specific sin does God command His leaders to denounce? Isaiah 58:1, 13, 14. Cry aloud, spare not, lift up thy voice like a trumpet, and ______ my people their transgression. ... If thou turn away thy foot from the sabbath, from doing thy pleasure on my holy day; and call the Sabbath a delight, the holy of the Lord honourable; ... Then shalt thou delight thyself in the Lord. God charges spiritual leaders to call Sabbath-breaking a sin and to insist that His people keep His Sabbath day holy. As with the disciples of old, our only safety is in obeying God rather than men (Acts 5:29). 15. When you decide to accept Jesus and fully follow Him, what happens? Matthew 11:29. Take my yoke upon you, and learn of me; for I am meek and lowly in heart: and ye shall find _____ unto your souls. Glorious rest and peace enter your heart at conversion. The Sabbath, which means "rest," is a symbol of the rest and peace that comes from the new birth (Hebrews 4:1-10). Those who are truly born again will keep the Sabbath as a blessed sign of that rest (notice verses 4, 9, 10). There is no joy like the joy that comes to a converted person who keeps God's Sabbath holy. 16. Before you can say "no" to the mark of the beast, you must say "yes" to the seal of God. Jesus is waiting at the door of your heart for an answer. Will you decide now to move under His glorious Sabbath banner as evidence that you have accepted Him as your Creator and Saviour? Here it is officially: "You will tell me that Saturday was the Jewish Sabbath, but that the Christian Sabbath has been changed to Sunday. Changed! but by whom? Who has authority to change an express commandment of Almighty God? When God has spoken and said, Thou shalt keep holy the seventh day, who shall dare to say, Nay, thou mayest work and do all manner of worldly business on the seventh day but thou shalt keep holy the first day in its stead? 1Library of Christian Doctrine: Why Don't You Keep Holy the Sabbath-Day? (London: Burns and Oates, Ltd.), pp. 3, 4.